Which Christmas Wreath has more ornaments? 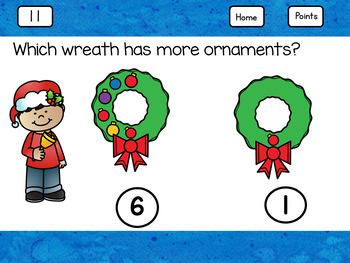 Which Christmas Wreath has less ornament? Students will count the ornament on the wreath and decide if it is more or less. The students get immediate, supportive, reinforcement from our self-correcting games. 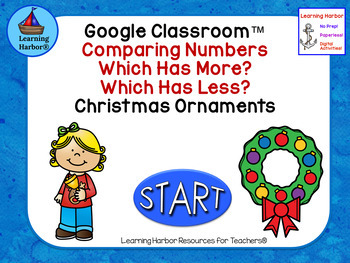 This comparing numbers, finding the one that has more, or the one that has fewer, with pictures, game is appropriate for kindergarten and pre-k students. It can be used with any device that runs Google Slides™ and it works with Google Classroom™. 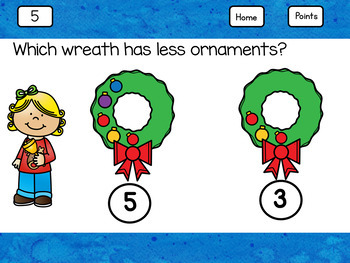 The student then touches or clicks directly on the Wreath with more or fewer Ornaments. 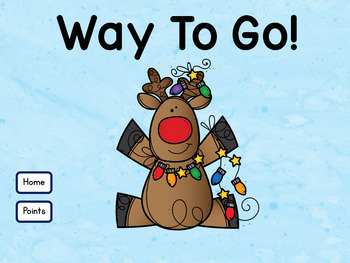 If the student clicks on the correct answer, a slide with “Way to Go!” will pop up. If the student clicks on the incorrect answer a slide with “Try Again, You’ll Get It Next Time” will pop up. The student then goes back to the homepage and clicks on another symbol to go to another slide and the game continues. Students can play in teams if you wish and keep points for each team. You can project the tally slide onto an interactive whiteboard or you can copy the black and white points slide. This game works very well in small groups and when projected onto a whiteboard. It would also work well in a computer lab or 1:1 with volunteers at the beginning of the year. Creating high quality games for use with Google Apps™ can be time consuming for teachers. Let Learning Harbor® Resources for Teachers help by providing affordable games that use up to date technology and aid students in increasing computer skills and dexterity, while improving math skills at the same time. This self-correcting, interactive activity for use with Google Classroom™ or any device that operates Google Slides™ will keep students engaged. All our activities for use with Google Classroom™ are aligned with Common Core State Standards.